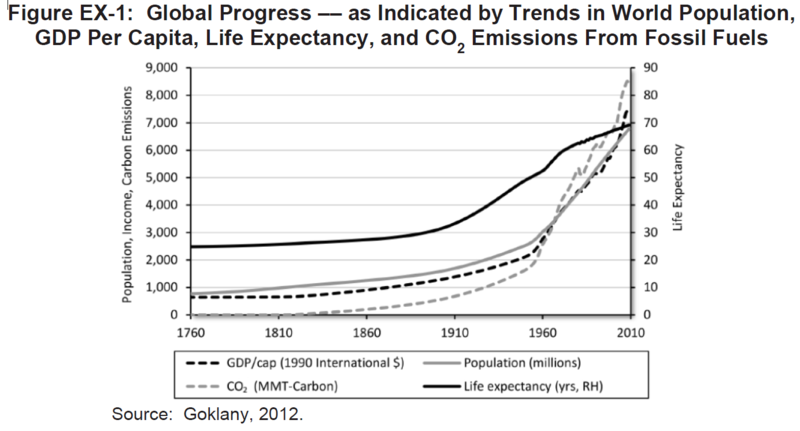 Although invented by academics curious about the economic implications of climate models, social cost of carbon analysis quickly became a form of computer-aided sophistry. 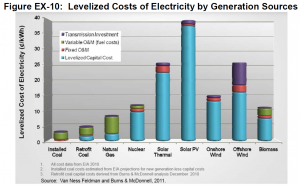 Its political function is to hoodwink the gullible into believing that fossil fuels are unaffordable no matter how cheap and that so-called renewable energy technologies (chiefly wind and solar power) are a bargain at any price. The social cost of carbon (SCC) is an estimate of the damage supposedly inflicted on society by the emission of a ton of carbon dioxide (CO2) in a given year. SCC estimates derive from a host of assumptions about highly speculative issues including: climate sensitivity (how much warming results from a given increase in CO2 concentrations); the impacts of warming on weather patterns, ice-sheet dynamics, and eco-system services; the economic impacts of the latter on agriculture and other climate-sensitive industries; and how human adaptive capabilities will evolve (how technology will develop) as the world warms. In addition, because the SCC is a guesstimate of cumulative damage over time, modelers can get big, scary-sounding numbers just by selecting low discount rates to calculate the present value of future projected damages. But, as noted repeatedly on this blog, even if SCC analysis were an exact science, it would still tell only one side of the story. It would still tell us nothing about the social benefits of carbon energy, hence nothing about the social costs of carbon mitigation. Divorced from analysis of carbon’s social benefits, SCC estimation even at its theoretical best is partisan advocacy posing as objective research. The Office of Management and Budget (OMB) requires federal agencies to estimate both the costs and benefits of proposed regulations and, to the extent permitted by law, ensure that the benefits of regulation justify the costs. In 2009, the Obama administration convened an interagency working group (IWG) on the social cost of carbon, which has so far produced two reports (2010 and 2013). Unsurprisingly the 2013 SCC estimates were about 50% higher than the 2010 estimates. The next report’s estimates will no doubt be higher still because warmism demands that its votaries always conclude that climate change is “worse than we thought.” That the administration would ever convene an IWG on the social benefits of carbon is unthinkable. So where can citizens turn to for balance? I have good news. In The Historic, Present and Future Societal Benefits of Fossil Fuels, a report prepared for the American Council for Clean Coal Energy (ACCE), Dr. Roger Bezdek of Management Information Systems, Inc. (MISI) not only documents the manifold economic and health benefits of carbon energy, he also makes a powerful case that the evident societal benefits of carbon outweigh the conjectural costs by orders of magnitude — a range of 40-1 to 400-1. The report’s abstract appears below. This report analyzes the impacts and benefits of carbon dioxide (CO2) and then compares these to estimates of the social cost of carbon (SCC) that have been published by the U.S. federal government. CO2 is the basis of life on Earth, it facilitates plant growth, and enhances agricultural productivity. It is the primary raw material utilized by plants to produce the organic matter out of which they construct their tissues, which subsequently become the ultimate source of food. Of primary importance, the successful development and utilization of fossil fuels, which generate CO2, facilitated successive industrial revolutions, created the modern world, and enabled the high quality of life currently taken for granted. 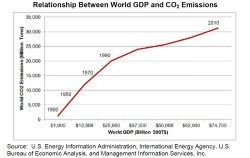 There is a strong causal relationship between world GDP and CO2 emissions over the past two centuries, and this relationship is forecast to continue for the foreseeable future. 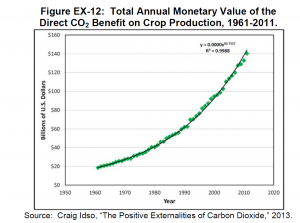 We compared these indirect CO2 benefits to the SCC estimates. While the SCC estimates are of questionable validity, we nevertheless compared the CO2 costs and benefits (on a normalized per ton basis) using the SCC estimates and assumptions. We found that the current benefits clearly outweigh any hypothesized costs by, literally, orders of magnitude: The benefit-cost (B-C) ratios range up to more than 200-to-1 (Figure AB-1). We utilized forecast data to estimate B-C ratios through 2040 and found that future benefits also greatly exceed hypothesized costs by orders of magnitude: In the range of 40-to-1 to 400-to-1. To place these findings in perspective, normally, B-C ratios in the range of 2-to-1 or 3-to-1 are considered favorable. Thus, our main conclusion is that the benefits of CO2 overwhelmingly outweigh estimated CO2 costs no matter which SCC estimates or assumptions are used. In fact, the SCC estimates are relatively so small as to be in the statistical noise of the estimated CO2 benefits. These findings must be used to inform energy, environmental, and regulatory policies. 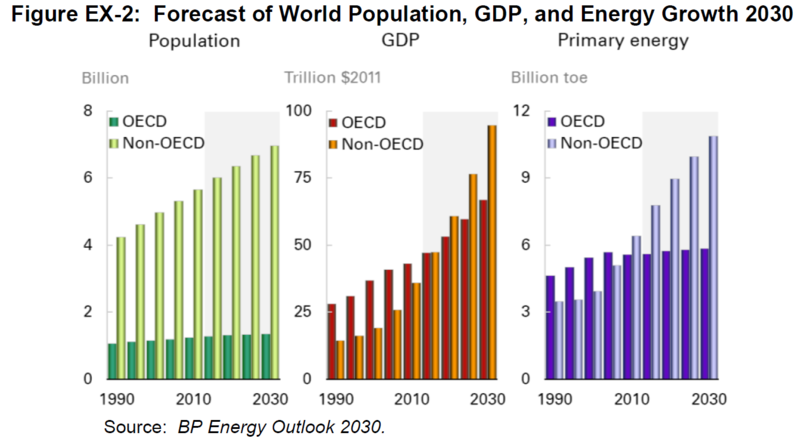 trillion – increasing from $19 billion in 1961 to over $140 billion in 2010. 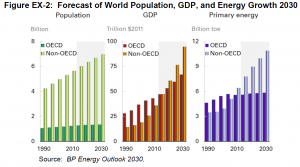 We forecast that over the period 2012 – 2050, these CO2 benefits will total $9.8 trillion. The 182-page report contains a wealth of information and numerous graphs and tables. Here I’ll excerpt some key passages and graphics. 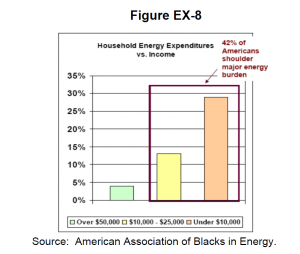 First, some excerpts on the social benefits of carbon energy. The successful development and utilization of fossil fuels facilitated successive industrial revolutions, created the modern world, created the world’s advanced technological society, and enabled the high quality of life currently taken for granted. 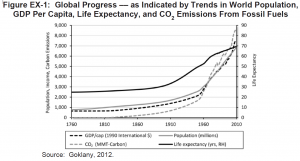 Over the past 250 years, global life expectancy more than doubled, population increased 8-fold, and incomes increased 11-fold. Concurrently, as shown in Figure EX-1, CO2 emissions increased 2,800-fold, increasing from about 3 million tons to 8.4 billion tons. 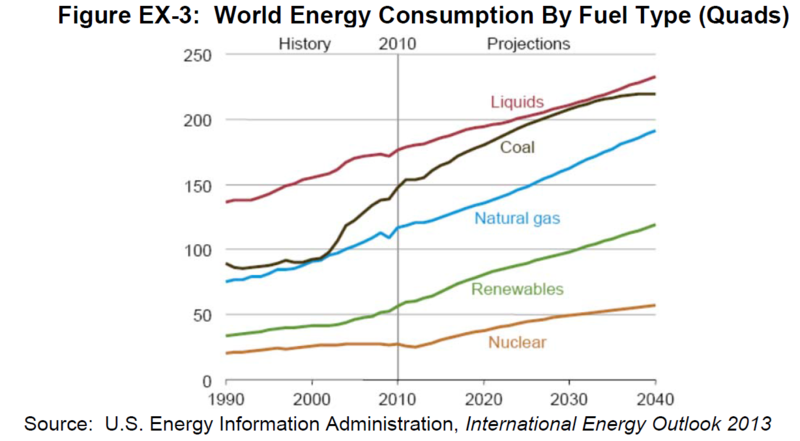 As shown in EX-2, population and economic growth will remain the key drivers behind increasing energy requirements. 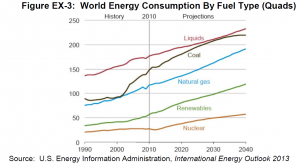 provide 75 – 80 percent of the world’s energy – Figure EX-3. 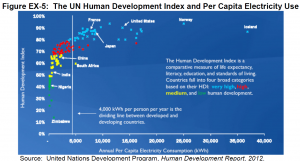 Electricity has created, shaped, and defined the modern world, economic growth and electricity usage are closely correlated, and electricity has facilitated virtually every technological achievement of the past 150 years. 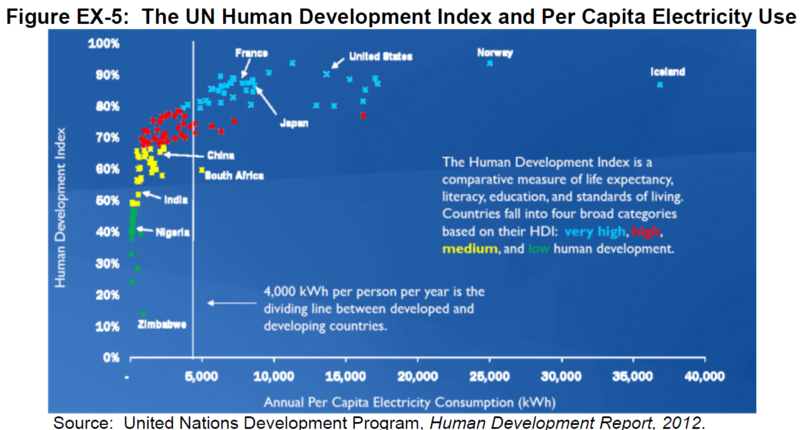 Electricity enables people to live longer and better and, as shown in Figure EX-5, the UN links electricity consumption to quality of life. 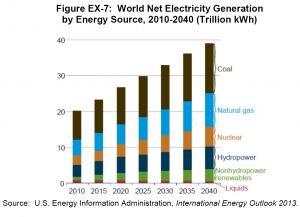 Coal is currently the world’s predominant fuel used for electricity generation and is forecast to remain so for at least the next three decades – Figure EX-7. Coal will provide a continually increasing share of world energy and, accordingly, a major new global build out of coal generation is under way driven by rapidly increasing demand in Asia. 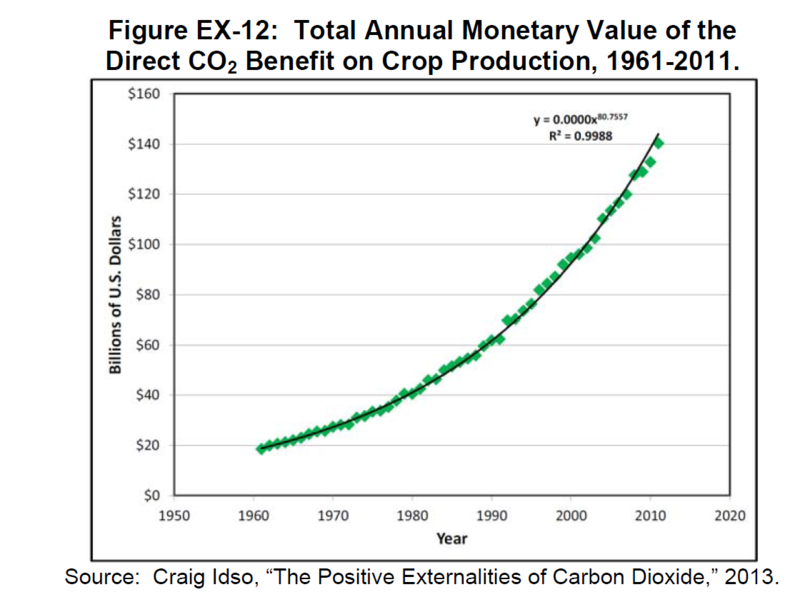 We assessed the annual total monetary value of the direct CO2 benefit for 45 crops over the period 1961-2011 and estimated that it cumulatively totaled $3.2 trillion – increasing from $19 billion in 1961 to over $140 billion in 2010 – Figure EX-12. We forecast that over the period 2012 – 2050, these CO2 benefits will total $9.8 trillion. Now some excerpts on the social costs of carbon mitigation. Increased energy costs are highly regressive, since they hurt the poor, low income families, and seniors living on fixed incomes much more than the affluent. 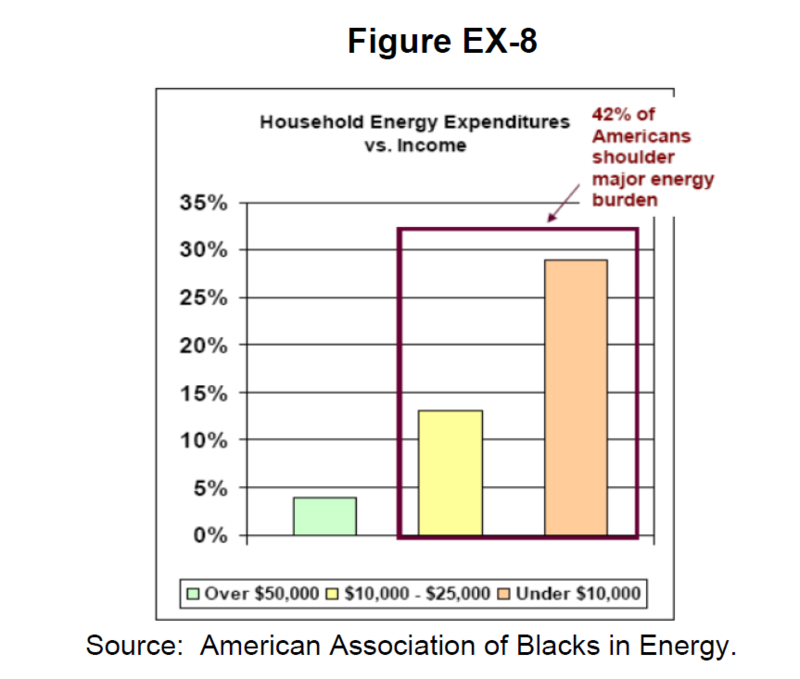 Expenditures for essentials such as energy consume larger shares of the budgets of low-income families than they do for those of more affluent families – Figure EX-8. For example, households earning $50,000 or less spend more on energy than on food, spend twice as much on energy than on healthcare, and spend more than twice as much on energy as on clothing. 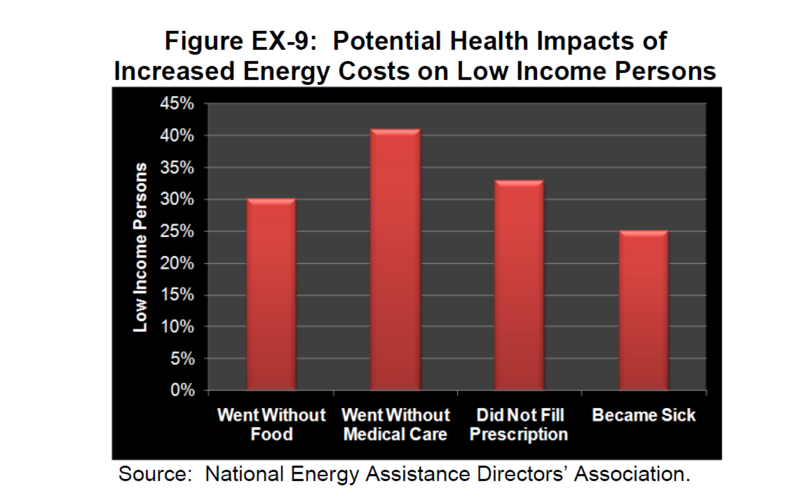 Further, being unable to afford energy bills can be harmful to one’s health – Figure EX-9. There is a strong relationship between the economy and jobs, on the one hand, and the price of energy and electricity on the other. Economists who have analyzed the issue agree that the relationship is negative: Increases in energy and electricity prices harm the economy and decreases in energy and electricity prices benefit the economy. This relationship is important because coal is the low-cost option for generating electricity – Figure EX-10.